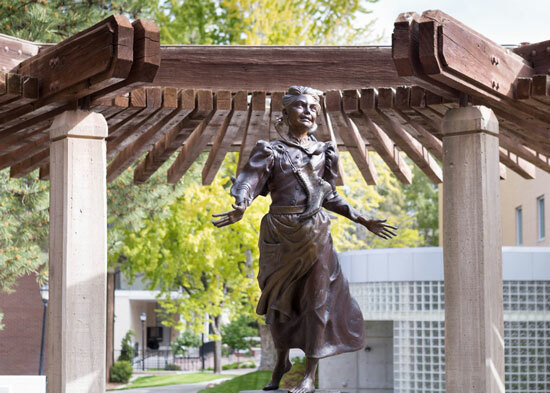 On the campus of Southern Utah University stands a bright and cheerful tribute to one of the area’s honored pioneer settlers, Ellen (called Nellie) Pucell Unthank. When 9-year-old Nellie left her home in Tintwhistle, England, she could not have imagined the journey that would follow. As depicted by sculptor Jerry Anderson, childhood for Nellie was bright and filled with opportunity. What she would survive of her expedition at such a young age would secure her place in the pages of pioneer history. And of her later life in Cedar City, Utah, a tale equally as admirable. With parents Margaret and William Pucell, Nellie and her sister Maggie, age 14, set sail at Liverpool, England in 1856 on a ship named Horizon. Leaving life and possessions behind, the Pucells looked forward to a bright future and plans for establishing a home with fellow Latter-day Saints in the new Rocky Mountain Zion. Six weeks later, they arrived at Boston where they met up with other members of the Mormon migration in traveling by train to Iowa. At Iowa City, the group joined the Martin Handcart Company for what would become the ill-fated final stretch of their transcontinental journey. As the group of just over 500 made their way pulling handcarts to Utah, they were beset by early winter snowstorms and cold temperatures as they reached Wyoming. On Oct. 19, snow and frigid temperatures hit the region, and as conditions only grew worse, some began suffering frostbite, hunger, exhaustion and hypothermia. Nellie’s father slipped into a bitterly cold stream while the company was attempting to cross, and died from exposure on Oct. 22, 1856. Her mother died five days later. Nellie’s parents were among an estimated 150 members of the handcart company who did not survive the journey from Iowa to Utah. When news of the company’s tragedy reached Salt Lake City, rescue teams were sent to aid and recover survivors. Those who remained of the Martin Company were found nearly covered in snow. Orphaned and maimed from frostbite, Nellie and Maggie were among survivors delivered by wagon to Salt Lake City Nov. 30, 1856. With frozen limbs through, Nellie’s injuries required amputation of both legs just below the knee. Maggie and Nellie later joined with fellow survivors of their handcart company and traveled south to settle at Cedar City, Utah. Nellie was 24, and though wooden legs and shoes were crafted to assist her, her pain was severe and prosthetics only exacerbated her condition. Instead, she moved about by crawling on her knees. 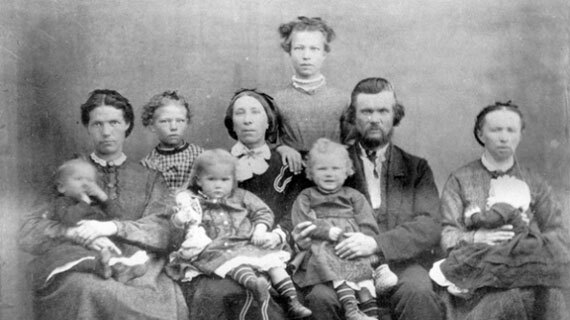 The Unthank family, with Nellie pictured on the far left. Nellie met and became a plural wife of William Unthank. She gave birth to six children and made an income by taking in washing, knitting and crocheting. Once a year, she was known for taking her children to clean the church house. And in constant pain, she worked to provide and serve in southern Utah. Nellie lived to age 69. A 1991 likeness of Nellie by sculptor Jerry Anderson beautifully commemorates her story. Gordon B. Hinckley, then first counselor to the First Presidency of the Church of Jesus Christ of Latter-day Saints, dedicated the monument to Nellie. “I could not help wondering whether there might be some ancestral connection between this daughter of England, whose courage we are celebrating here today, and a famous daughter of France, whose real name was Jeanne La Pucell but who is better known as Joan of Arc,” he said in his remarks. “Both share not only the name Pucell, but of course they also share similar spirits. For both showed forth that quality of endurance which enabled them to triumph over adversity and to remain faithful witnesses to the ends of their lives." The story of Nellie Pucell represents strength and fortitude. As a mother, she taught her children to work, serve and seek education. Agnes, one of the Unthank children, born in 1877, was among the first students enrolled at Branch Normal College (the first name of Southern Utah University) dedicated in 1897.